Having buried and protected your ill-gotten booty, it's time to send your crew to search for the treasures of the other scurvy pirates. Collect clues as you piece together the maps. Figure out the correct islands, disarm the booby-traps and dig at the right landmarks. Steal their treasures and be the first to take your Plunder! 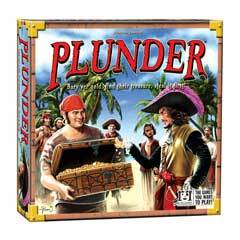 Plunder is a deduction card game in which everyone is a pirate captain with a buried treasure. Players attempt to steal the hidden treasures of the other captains by figuring out the three landmarks that mark where each treasure is hidden. The first player to a treasure takes the largest share, while those who reach it second or third receive less. Keeping your treasure from being stolen is also worth victory points in the end. Find and steal the most treasures first to win in the end!